Crisp, black and white illustration-style Mandolin Orchestra design harkens back to the early 20th century and the orchestras formed by players of the old bowlback mandoolins, mandolas, mandocellos and even mandobasses! This is a design that’s sure to please any mandolinists. mandolin lovers and music nostalgia buffs. Also be sure to visit our whole Ivory Picking Gear section for more great designs and gift ideas! 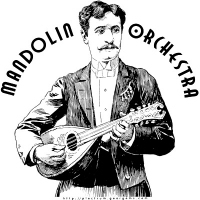 You can buy Mandolin Orchestra now on a t-shirt, hoodie, mug, clock, bag or other quality gift or apparel item, exclusively from GearGems!